As much as we like to rib each other about our differences, France is no different from America when it comes to a few things. You can discuss amongst yourselves some of the other things, but the one I want to talk about today is green onions, or scallions, as they’re called in certain parts of the United States. No one can quite agree on what they should be called so you’ll see them labeled as either at markets or grocery stores. The one thing about them, though, is that they’re plentiful. I think every supermarket in America carries them and they’re very common. The French use a lot of onions and their relatives, most notably leeks and shallots. But come spring, bundles of other kinds of onions show up at the markets, like the two that I picked up this week. However we don’t really get exactly what we call “scallions” in France. 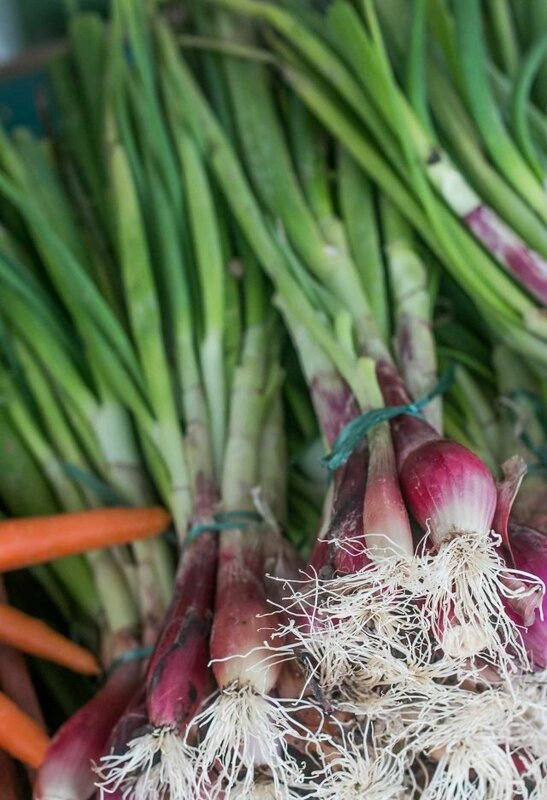 Come spring, all sorts of lovely onions, of different shapes, widths, and names, spring up at the markets. There are cives, civettes, cébettes, ciboules, and ciboulettes, the last one corresponds exactly with an English language counterpart: chives. But if you ask the average Joe, or Joséphine, on the street, I think they would be hard-pressed to explain the differences between them. One could go down the rabbit hole of the internet cross-referencing with Latin names, etc. If you do, please publish that list (with photos, please) for the rest of us to reference. In the meantime, I’m happy to just use the delicate, aromatic onions – whatever they’re called. At the market, whenever I see a bunch of whatever-you-call-’em I can’t resist putting a bunch or two in my basket and bringing them home to cook with. I don’t think people use the green tops in France as much as they do in other cultures and cuisines; it’s the bulb ends that are more prized. Flatbreads in France are often referred to as pain libanais, or Lebanese bread. And our friends in Lebanon do indeed deserve credit for their wonderful flatbreads, like Man’ousche. Farther away, on the other side of the world, there are Chinese Scallion pancakes, usually served as appetizers. They’re made differently and have a bit of crunch, where these are more bread-like. The dough for these is a bit sticky, due to the scallions (or green onions, or whatever you want to call them) in the dough. Be sure to have a brush handy to brush off excess flour after rolling. You could cook these on a grill outdoors although I did them in a cast iron skillet. Used whole, you could use them for rolled up sandwiches, like Moroccan-spiced grilled chicken kebabs. Cut into wedges, these are great served with salads or with dips. 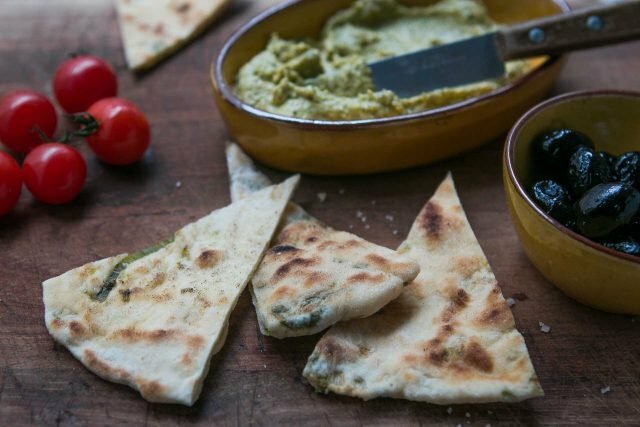 Some suggestions include White bean dip, tarama, hummus, artichoke tapenade, eggplant caviar, tapenade (there’s a recipe for green olive, almond and basil tapenade in My Paris Kitchen), raita, or baba ganoush. If you don’t have a stand mixer, you can mix and knead the dough by hand on a lightly floured countertop. I’ve not tried these with instant or fresh yeast, but if you want to try using one of them, check the yeast manufacturer’s website for guidelines.As mentioned, the trick is just to brush off as much flour as possible after rolling them out. The dough is somewhat sticky but they don’t need to be perfect circles. In fact, I like them better when they look more rustic and have some “character.” I used olive oil, which gets a bit smoky. If you have a favorite oil with a higher smoking point, you can certainly use that. To cook them on a grill, roll them out through step 6 and place them on a grill that’s been brushed with oil first. They might take more of less time to cook, depending on your grill. (I haven’t tried baking them in the oven, but if you do, let us know how they turn out. )Flatbreads are best when they are freshly made, but if you’re having a bbq, you can make and roll them out and place them on a baking sheet (it’s okay if they are overlapping), then refrigerate them until you’re ready to grill them off. 1. In the bowl of a stand mixer, mix the yeast, sugar and water. Let stand 10 minutes for the yeast to proof. 2. Add the olive oil, flour, salt, and a few good turns of freshly ground black pepper, and knead on medium high-speed with the dough hook attachment until the dough is smooth and elastic, about 5 minutes. You may need to add a sprinkle more of flour if the dough is too wet, or a bit of water if it feels too dry. Cover the bowl with a kitchen towel and let rise 30-45 minutes. 3. Add the scallions to the dough and stir them in with the dough hook. Scrape the dough from the mixer bowl onto a lightly floured countertop and divide the dough into six pieces. 4. Working near the stove, roll each piece of dough into a 5-inch (12cm) round, dusting them with just enough flour (top and bottom) to keep them from sticking to the counter. Once you’ve rolled all six, let them rest five minutes. 5. Heat a cast iron skillet over medium high heat. 6. Roll the first disk into a larger circle, about the size of your skillet. (I used a 10-inch, 25cm, skillet, rolling them into 8-inch, 20cm, circles.) Brush the skillet with a lashing of olive oil and drape the flatbread in the pan. Let cook for 2 minutes on the first side, or until browned and blistered, then turn the flatbread over and cook the other side until it’s blistered as well, about another 2 minutes. While you’re cooking one flatbread, start rolling out the next one and continue with the rest of the circles of dough, brushing the pan with oil between frying each flatbread. Do-ahead: These don’t improve when they sit for a long time after baking. If you’d like to start them in advance, the dough can be refrigerated before rising and kept up to overnight in the refrigerator. To avoid it drying out, you can drape plastic wrap over the surface of the dough. Let it come to room temperature, then let rise for 30-45 minutes. As a Brit, in English, they are definitely spring onions. But shallots are quite a different being. They are a bit like onions but in ‘segments’. Delicious! In Australia and NZ, the segmented shallots you’re referring to are often called ‘French Shallots’. I’m Australian too, but I grew up in NZ. We always called them ‘spring onions’ if they didn’t have a little white onion bulb at the end, and ‘shallots’ if they did. 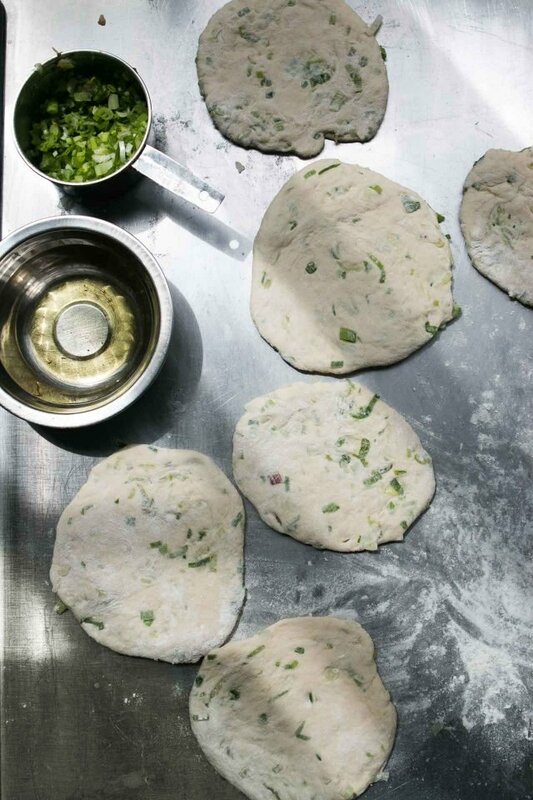 I’ve been hankering for some Chinese-style scallion pancakes lately, but I might make these instead. At the Carcassonne market, the vendors ask me whether they should cut off the green ends for me, and they’re surprised when I tell them the green part is what I want. It’s great how vegetables soften up dough. I’ve been experimenting with some non-sweet versions of zucchini bread/carrot cake, more like what the French call “cake,” but with whole wheat and oatmeal. The vegetables keep the dough from turning into concrete. I recently posted a recipe and would love to know what you think. Love these too, what ever they are called. I would say spring onions but at me local market in Le Bugue, they are “Les onions” nothing more or less. Called scallions in Ireland and its usually only this time of year that you see the ones with the big bulbs. We use the white and the green parts. Lovely chopped up in salads. I recently purchased the Hot Bread Kitchen cookbook (from the Brooklyn bakery) and trying to make my own bread at home. I didn’t realize how much there is to learn, but it’s great eating bread that tastes much more natural than what I can buy here in the US. I live in south Texas and recently bought a small rolling pin that’s used to roll out tortillas. Hoping it will work for rolling out flatbread. The best thing about scallions (or whatever you want to call them) is that you can plant the bulb ends in a pot and get fresh scallions for several months! Just keep snipping as needed. Nice! I love any flatbread! We call them “oignons nouveaux” in France and of course we use the green tops. They can be an alternative to ciboulette. Claude, bravo – but sadly you ARE in the minority. The number of times I’ve been asked if I want the green taken off… Now at least at the market stalls they know I buy them mostly FOR the green, and sadly I’m no longer offered the ‘cut offs’ of other buyers… So there is hope! They are spring onions here in the UK, though I have never seen ones with such fat bulbs as the ones pictured! 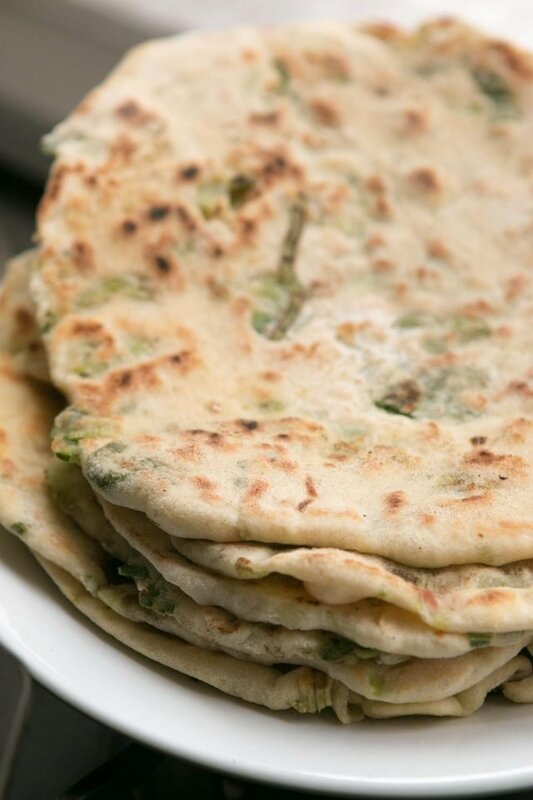 Flatbreads are a great use for them, I’ve made Chinese style spring onion pancakes before but am keen to try your yeasted flatbreads, I think they would be delicious with cheese. 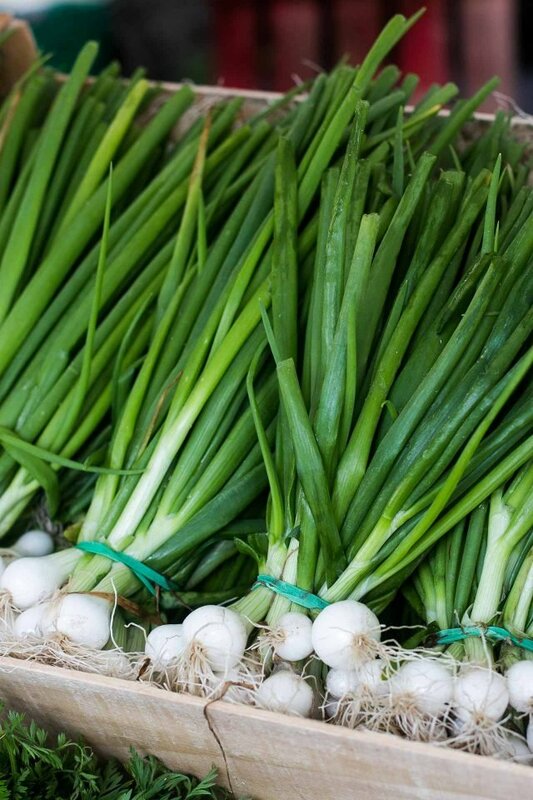 Here in Pennsylvania, they are called spring onions, scallions, or even green onions. I grew up eating spring onion sandwiches….squishy white bread slathered with butter, sprinkled with sliced onions. But, only in the spring, as the onions we DIDN’T pull for sandwiching eventually grew up to be the bulbous white and yellow onions we stored in the root cellar for winter use.! Here in New Orleans everybody calls them shallots. Real shallots are rarely seen. Love how hard you’ve worked to cover every possible question anyone could possibly have ever, in advance, in the text. Really amusing for someone who always reads all the comments, haha! Sounds great, and easier than Chinese scallion pancakes. But for a recipe that says it makes eight flatbreads, why do you cut the dough into six pieces? Thanks David, I think I am going to LOVE the recipe, exactly what I need for my son’s graduation party. I planned a “around the world” buffet including Mediterranean recipes but I need to organize ahead. if they are like Lebanese flat bread, for sure they dry out quickly !!! Can they be frozen ? I have not made these in years and I like your method better than the one I followed. Years ago when I was still cooking for a living, I catered dinner every week for a group of sportmen. Their club had a kitchen but it only had two burners and no oven. So could prepare dinner, but I would bring home made bread or rolls or make scallion pancakes for them. They were quite popular. But I did it the asian method I guess you would calll it, after the dough was divided into rounds they were rolled out, topped with oil and chopped scallions, then rolled up jelly roll style and spiraled like a snail. Then they were rolled out again flat which gave them more layers. I never thought to just roll them once and griddle them. Much easier with the same taste. Like why make it easier for myself? Lacking a cast iron pan, I can’t wait to try this in the oven. 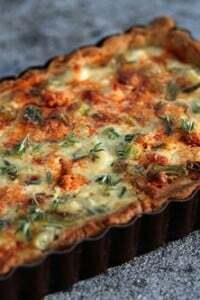 Local spring onions are out in full force, and the greens (lightly sauteed) make a great quiche. Called scallions here…use them a lot. 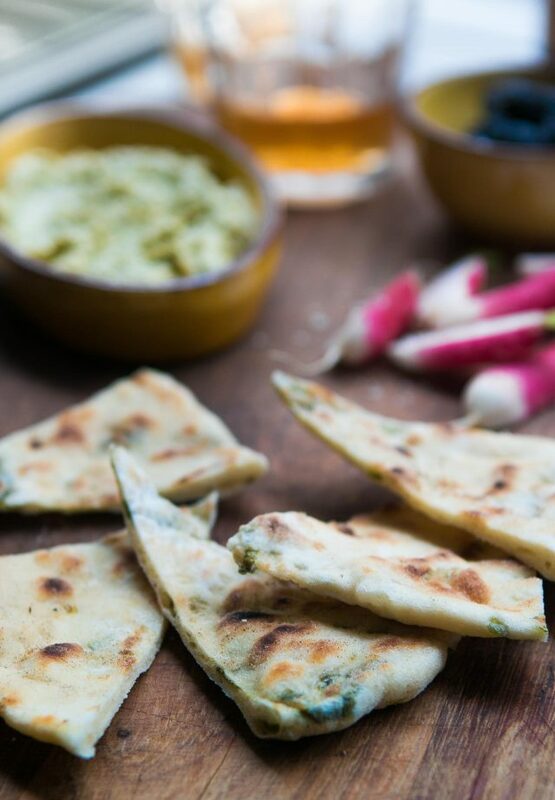 Making Mediterranean Flatbread this weekend – great idea to liven them up. 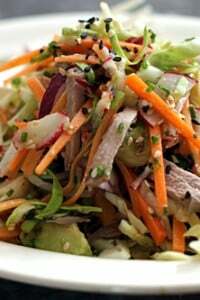 While reading this great recipe idea, the thought crossed my mind, why not add sliced radishes for more colour and added flavour. Do you see a problem doing this as realize mostly radishes are never cooked. Too much water content in a radish, perhaps? Just yesterday I wanted to know from the seller of ‘them’ why they would call them ‘ognions blanches’ when the important bit of them is GREEN.. and I got the usual look of ‘where do you come from’, so no help. To me they are ‘green onions’, contrary to the ‘normal’ onions, yellow, red etc. 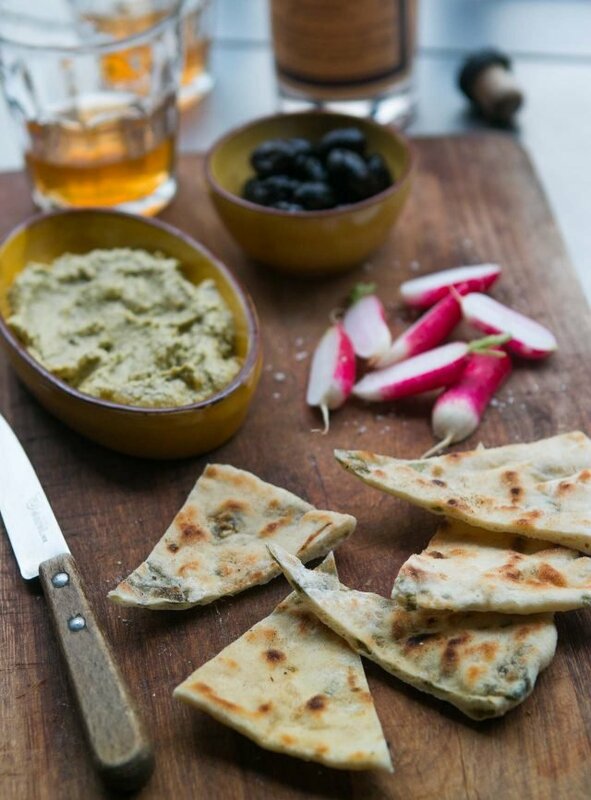 Love the flat breads – in every kind and fashion! So happy to see you cover these tasty breads! Our family makes these regularly and use them for sandwiches. Just yesterday, I spread goat cheese over the surface, topped it with diced homegrown heirloom yellow tomato, a chiffenade of basil and a splash of Italian spices. Oh Yum!! These little breads can be used a hundred ways and they are all delicious. Anyone try freezing the breads? Thank you very much for another one of your amazing recipes! After making the frozen zabaglione – bit hit- I was ready for something savory. I did the first batch to be our appetizer before dinner, but it became very popular and the pieces were “evaporating” by the minute. I even had to give one to our repairman who kept complimenting on the smell… so I ended up making 2 (two) more batches and made it our actual dinner. The only 2 things I changed: I used half the yeast (just gave it an extra 1/2 hour rising time) and stretched it by hand. It was too sticky for my rolling pin. Oh, and made smaller ones… Delicious!! So, the dough is like a pizza! Well, that’s easy!! I’m in Australia where we generally call them spring onions (though some call them shallots). Interestingly I taught a class in Rome a couple of weeks ago and they were basically impossible to find. As in France, they were all about the bulbs at the bottom. Your flatbread looks and sounds fantastic and I can’t wait to make it! I discovered that turning my wok upside down makes a roundish flat bread similar to the impossible to make at home Lebanese breads. I do a very fast pass on the griddle for one side and then finish them with a somehow forceful (two serving spoons are perfect to “mold” them to the wok. You have to be fast or you are bound to end with some burnt edges but they are so much fun to make that it is worth the trouble. Fun to make with someone else too as one can take care of the griddle and the other of the wok. And for those who wonder what to call them in other languages, Wikipedia to the rescue. Actually I am copying the whole thing into my phone, you never know when you may need to ask for a green onion somewhere. In France you have onions (common yellow, sweet white, red to be eaten raw and “rosé ” pink from Roscoff AOP) Also the “oignon tige” (stem onion), you’ll eat the small raw bulb at Springtime. California = green onions. No bulging bulb. The more slender the better. But as mentioned up the thread, Brits I have lived with call what we call “green onions” (no bulging bulb) “spring onions”. I have green onions overflowing the boxes in my garden, so I made these this afternoon, along with the recommended Moroccan chicken recipe. Both were really excellent. It was crazy hot, so I decided to cook them outside on the grill: worked really well and highly recommended. I served with Greek yogurt, but next time, I think I’ll make a full Greek salad or somesuch to serve with it. Hi David, I made these flat breads yesterday for Father’s Day with harissa grilled chicken, a tomato, cucumber & feta salad & hummus. The breads were delicious and really made the meal. Used garlic scapes instead. Yum. And served with chickpea-tahini soup (NYTimes). Terrific combo. Thank you! Lovely recipe. Spring onions are romantically called cambray onions and often grown much bigger to the average stage of harves in europe but smaller than a ping pong ball. I really love onions but not raw, I prefer their morre gentle, sweet tender texture. Will defenitely try this recipe soon, I love adding texture to my breads!. Delicious! We can’t stop making these. In Ireland we call them Spring onions or scallions. I’ve recently become completely addicted to a recipe using ONLY the green parts! It adds up to way more than its parts & is ridiculously delicious. So, you could try this too. It’s like a pesto sauce & is originally an Indian recipe, to add to cooked rice, but works brilliantly with Mexican or Thai food too. And on top of grilled or baked fish, chicken, lamb….Or in a sandwich / wrap. Blitz together the green parts of 3 scallions, 1 green jalapeno, 1 Tbls lime juice, 1 Tbls olive oil, 1 good handful (fistful!) coriander, including stalks, good amount of salt to taste. I made these subbing garlic scapes for the green onions/scallions. 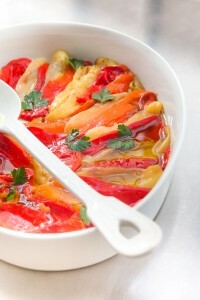 The result was savory and delicious and paired nicely with your turnip pickle recipe. Thanks so much for the recipe. I find the red bulbed scallions have more flavour than the white bulbed ones. What do you think?